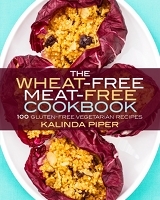 This recipe appears in my book The Wheat-Free Meat-Free Cookbook: 100 Gluten-Free Vegetarian Recipes. Check out the book on Amazon if you’re looking for more tasty recipes. Lovely eggplants were one of the finds at the farmer’s market this week. 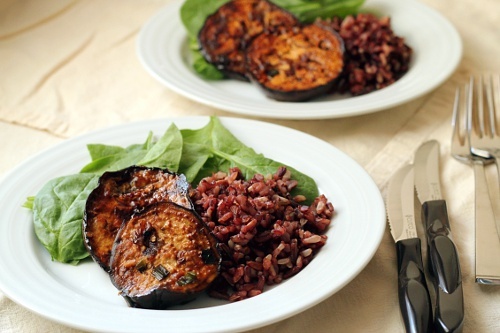 As many of you probably know, eggplant is great at soaking up flavors. Teriyaki sauce has been on my mind recently, and I figured eggplant would be the perfect way to highlight it. Combine everything except the eggplant in a small pot. Set over medium heat and simmer for about 10 minutes. The sauce will thicken slightly. 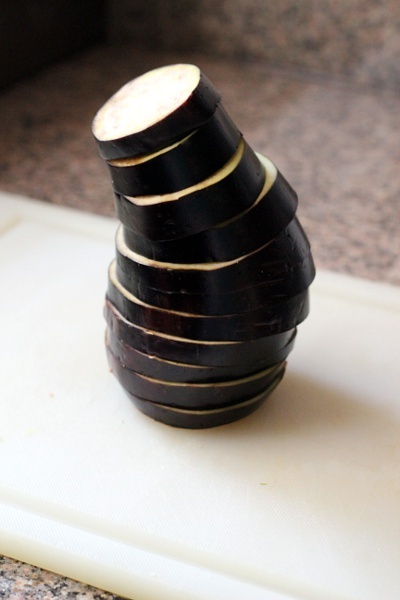 Lay the eggplant slices in a casserole dish or place in a large Ziploc plastic bag. Cover with the teriyaki sauce. Marinate for 1 hour, turning occasionally. Preheat the oven to 350°F. Grease a large baking sheet. 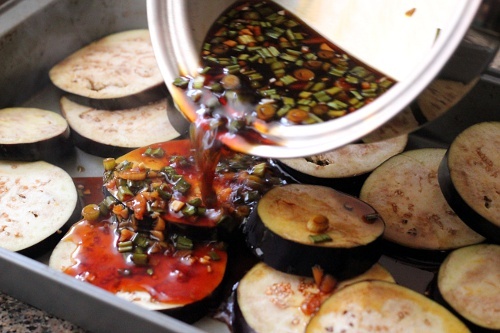 Remove the eggplant slices from the marinade and set in a single layer on the sheet. Bake for 45 minutes, turning once. 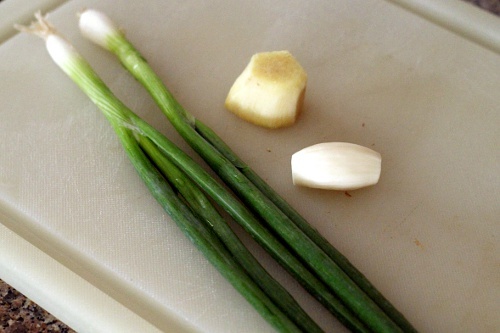 In the last 5 minutes of cooking, return the marinade to the pot and set over medium heat. Let the marinade cook down to a thick sauce. Plate the eggplant and spoon the marinade over the top. Mirin is a sweetened rice wine. If you can’t find mirin and substitute sake or white wine, add a tablespoon or two of sugar to the teriyaki while it’s cooking. The pretty pinky-purple rice I had is Lundberg Wild Blend. Lundberg Farms grows numerous varieties of rice. I’ve enjoyed every one I’ve tried. I’ll admit that they can be kind of pricey for rice, but it’s worth it every now and then. The eggplant worked well with the rice and spinach. I cut up my eggplant and mixed them all together into a salad. This recipe is also being shared in Slightly Indulgent Tuesday, Wellness Weekends and Seasonal Sunday. You know, I think this is the first eggplant recipe that’s ever tempted me! I feel like a crappy vegetarian sometimes for not really liking eggplant. :-) But this one looks great! Maybe I’ll try cooking eggplant for the first time! You know what I’ve been wondering? We see all your new recipes, but I’m curious to know what recipes you have in heavy rotation. I have a few recipes that I love so much (grilled citrus tofu!) that I end up making them at least a few times a month. What are your favorites? Ha, I can feel kind of the same way about eggplant. It’s easily made bitter and not very appetizing. As far as what recipes we make over and over. For breakfast I love the Yeasted Waffles. They’re so light and airy. The Fried Eggs over Mushrooms and Onions also get made frequently. Sometimes I substitute spinach in for the mushrooms or use a combination of both. As to other meals, we’ve been eating lots of the Lentil Salad for weeks now. I’m also partial to the Basil Butter Beans (the 4th recipe I posted!) and the Vegetarian Chicken Salad. We really like beans. Heh. In the colder months, the Tumeric Roasted Cauliflower is pretty common. There’s also a couple base recipes I use, similar to the Asian Soup that I make endless variations of, but I haven’t shared them here yet. Maybe I’ll get them up here someday. What a fun question, thanks for asking! 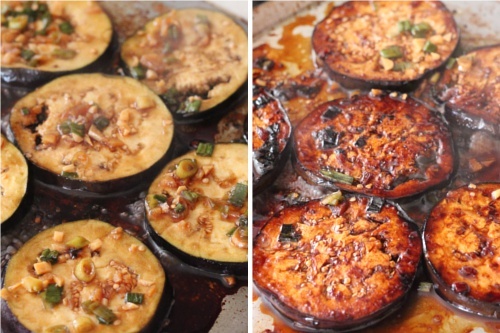 The eggplant steaks look amazing.. never tried teriyaki eggplants so these go to my must try list for sure! Janet: I saw many recipes that called for a mix of sake and mirin. I figured it’d be easier for folks to try and find one “unusual” ingredient instead of two. Richa: It was my first try too. (Well, I made a couple versions to make sure I had it right.) As I said above, I’m kind of iffy about cooking eggplant, but I really liked how these came out. These look fantastic Kalinda! 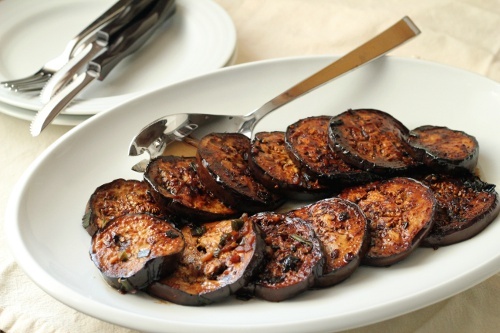 I’m not a great fan of eggplant but this recipe may well tempt me to buy some! I’m a vegetarian wheat-free person and so happy to find this website! I’m going to try cooking these tonight for my friend who is a chef, so I hope they go well… I’m sure they’ll be yummy, they look so good! I just made this and it was DELICIOUS! My husband and I are trying to eat more vegetarian and this was a perfect dish. We put it on top of brown rice. Yummy!